Today (for my Australian readers, anyway) is the full-moon birthday of Lord Balarama, the eternally youthful brother of Lord Krishna. This evening I’m attending the Hare Krishna festivities here in Sydney. In sacred Vedic theology, it is described how Lord Balarama is the first personal bodily expansion of Lord Krishna, the Supreme Personality of Godhead. All other incarnations expand from Him. In Lord Krishna’s earthly pastimes, He plays as Krishna’s older brother. 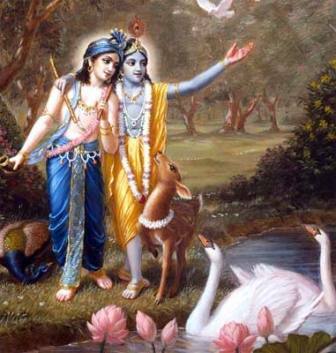 Together Krishna and Balarama enact many pastimes as cowherd boys in the land of Vrindavana. Lord Balarama carries a plow and club and is known for His great strength. Whereas Krishna is blue, Balarama is white. Lord Balarama is the bestower of spiritual strength, an essential and special blessing needed for us to be successful on the long and sometimes rocky road that is spiritual life. It is especially auspicious to invoke Lord Balarama’s generous benedictions on this day. “Powerful Lord Balarama is sixteen years old, full of the luster of youth and has a fair complexion the color of crystal. He wears blue garments and a garland of forest flowers. His handsome hair is tied in a graceful topknot. Splendid earrings adorn His ears and His neck is splendidly decorated with garlands of flowers and strings of jewels. Splendid armlets and bracelets ornament Douji’s graceful and very strong arms and His feet are decorated with splendid jeweled anklets. Lord Balarama’s beauty is enhanced by the earrings touching His cheeks. His face is decorated with tilaka made from musk, and His broad chest is ornamented with a garland of gunja. Balarama’s voice is very grave and His arms are very long, touching His thighs.